I'm so excited about this book! I was drawn into the story by the end of the first chapter. Then the second chapter had me flipping pages at break-neck speed! It's a sister story. Every child prodigy grows up eventually. 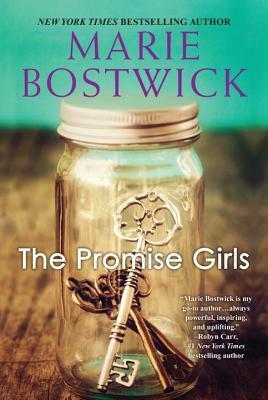 For the Promise sisters, escaping their mother's narcissism and the notoriety that came with her bestselling book hasn't been easy. Minerva Promise claimed that her three "test tube" daughters--gifted pianist Joanie, artistic Meg, and storyteller Avery--were engineered and molded to be geniuses. In adulthood, their modest lives fall far short of her grand ambitions. But now, twenty years after the book's release, she hopes to redeem herself by taking part in a new documentary. Meg, who hasn't picked up a paintbrush in years, adamantly refuses to participate, until a car accident leaves her with crushing medical bills. While she recuperates in Seattle, the three sisters reluctantly meet with filmmaker Hal Seeger, another former prodigy. Like them, he's familiar with the weight of failed potential. But as he digs deeper, he uncovers secrets they've hidden from each other--and a revelation that will challenge their beliefs, even as it spurs them to forge their own extraordinary lives at last.